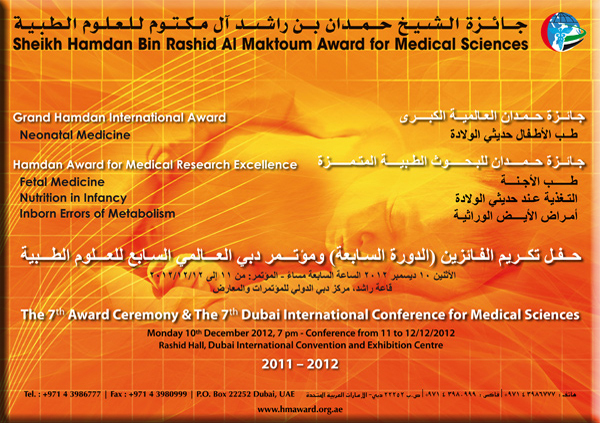 The topics of the 7th term, 2011-2012 were selected to be for Grand Hamdan International Award -Neonatal Medicine, and for Hamdan Award for Medical Research Excellence - Fetal Medicine, Nutrition in Infants, Inborn Errors of Metabolism. The practice of neonatal medicine has changed tremendously since its recognition as a separate entity in 1975. Complex new technologies like extracorporeal membrane oxygenation (ECMO) and simple ones like the administration of surfactant resulted in increased survival of very small babies who would have succumbed to their illnesses a few years ago. Benefits of antenatal care have been recognized by most mothers, and have resulted in the decrease in incidence of neural tube defects and the fetal alcohol syndrome. One of the most remarkable discoveries was that of Rh incompatibility in the newborn. Philip Levine and Alexander Weiner published seminal papers in which they analyzed in detail the problem of Rh incompatibility. In 1938 Ruth Darrow who had her own problems with Rh disease made a brilliant analysis of the literature. She reasoned based on literature that the mother was a constant factor and deduced that the disease was an acquired one with the mother producing a substance that did not affect her but transmitted through the placenta to affect the fetus. In 1940 about a year after Levine's important paper on the fetus' ability to immunize the mother, Weiner described an experiment in which he injected red cells from the rhesus monkey into a rabbit which produced an antibody which reacted with 80% of human blood. Following this many other developments occurred, including study of blood group inheritance, Coomb's test, exchange transfusion and intrauterine transfusion. Other momentous discoveries were "Koagulations Vitamin" (Vitamin K) by H Dam in 1936 and Vitamin K treatment of coagulation abnormalities of the newborn by WW Waddell in 1937. 1938 saw the design of the modern infant incubator (prototype of isollette). Retintopathgy of prematurity was first linked to oxygen usage by Cambell in 1951 and Virginia Apgardescribed the Apgar score in 1952. In 1953 Emerson invented the high frequency oscillatory ventilation (HFOV). Mary Ellen Avery and Jere Meaddetermined that surfactant deficiency was the cause of neonatal respiratory distress syndrome. Robert Gurthrie described the Guthrie test for phenylketonuria in 1963. Gregory in 1971 used continuous positive airway pressure for respiratory distress syndrome and Kirby described the use of intermittent mandatory ventilation for respiratory distress syndrome. Another advance was the use of antenatal glucocorticoids for prevention of RDS in 1972. A major milestone was the description of the use of surfactant for the treatment of Respiratory Distress Syndrome in 1980. Other very significant discoveries occurred that paved the way for the modern improved care of the premature infant. The last half century has seen extraordinary advances in fetal medicine. Prematurity, preeclampsia, diabetes, rhesus disease and rubella took a large toll on perinatal survival. In those days amniocentesis, ultrasonography and cardiotocography were not yet available. Knowledge of fetal physiology and pathology was sparse. In 50 years since, the fetus has been thoroughly studied with new modalities being introduced that helped us understand the fetus better. Advances in fetal imaging, genomics, and minimally invasive techniques, as well as a better understanding of the natural history of many fetal diseases, mainly from animal studies, have over the past few years revolutionized the management of many fetal conditions diagnosed prenatally. Now perinatal mortality has decreased significantly, with babies born at 23 weeks having a chance of surviving whereas in the past babies born at gestation ages less than 34 weeks had a slim chance of survival. Rhesus disease has decreased remarkably and fetal aneuploidy can be detected by prenatal genetics in the first trimester. The rapid advances in embryology have increased our understanding of the processes involved in different organ formation. For decades pediatric surgeons agonized over their inability to save babies from deadly defects after birth. Since 1981, when Harrison performed a pioneering in utero procedure to treat a fetal urinary-tract obstruction, hundreds of fetuses have undergone treatments ranging from tumor removal to spinal-cord repair. Some operations have been dramatic successes, saving the lives of babies who would otherwise have died. Others have been heart-wrenching failures. In no other medical area are the stakes—two patients, not just one—so high. Now repairs of congenital diaphragmatic hernia, temporary tracheal occlusion for diaphragmatic hernia, fetoscopic laser treatment of A-V communication in twin-to-twin transfusion syndrome can be performed in-utero. Today's state of the art ultrasound machines are equipped with 3 D and 4 D ultrasound technology. The introduction of this technology enabled physicians to add a new dimension to gynaecological and obstetrical ultrasound imaging. 4-D Ultrasound System takes 3-D images of the fetus and adds another dimension: time, resulting in a trueto-life image. Conditions like cleft lip/palate, cysts, scoliosis, hand anomalies, skeletal malformations, spinal bifida and heart defects can be clearly seen. Throughout the first year, many physiological changes occur that allow infants to consume foods of varying composition and texture. As an infant’s mouth, tongue, and digestive tract mature, the infant shifts from being able to only suckle, swallow, and take in liquid foods, such as breast milk or infant formula, to being able to chew and receive a wide variety of complementary foods. For proper growth and development, an infant must obtain an adequate amount of essential nutrients by consuming appropriate quantities and types of foods. During infancy, a period of rapid growth, nutrient requirements per pound of body weight are proportionally higher than at any other time in the life cycle. There have been many developments that have increased the likelihood of the preterm infant growing normally. Good nutrition delivery is possible even in the tiniest of infants. Those unable to feed enterally can be fed pareneterally. Pareneteral nutrition provides most nutrients required by the growing infant. Seminal work in this field has resulted in the provision of enteral feeding even to the tiniest of infants immediately after birth. Inborn errors of metabolism (IEMs) are rare taken individually but collectively they are common. They usually present early in the neonatal period or infancy but can occur at any time, even in adulthood. These errors occur because of single gene defects which result in abnormalities in the synthesis or catabolism of proteins, carbohydrates, fats, or complex molecules. Most of these defects are in an enzyme or transport protein, which result in a block in a metabolic pathway. Effects are due to There are toxic accumulations of substrates before the block, intermediates from alternative metabolic pathways, defects in energy production and use caused by a deficiency of products beyond the block, or a combination of these metabolic deviations. Nearly every metabolic disease has several forms that vary in age of onset, clinical severity, and, often, mode of inheritance. Goals of treatment for patients with an inborn error of metabolism (IEM) are prevention of further accumulation of harmful substances, correction of metabolic abnormalities, and elimination of toxic metabolites. Even the apparently stable patient with mild symptoms may deteriorate rapidly with progression to death within hours. With appropriate therapy, patients may completely recover without sequelae. Recent innovations in medical technology have changed newborn screening programs. The widespread use of tandem mass spectrometry is helping to identify more inborn errors of metabolism. Improvements in medical technology and greater knowledge of the human genome are resulting in significant changes in the diagnosis, classification, and treatment of inherited metabolic disorders. Many known inborn errors of metabolism will be recognized earlier ortreated differently because of these changes. A native of the United States of America, 65-year-old Prof. Jeffrey Whitsett is acknowledged as an international expert with a distinguished track record of research and recognition in the Neonatal Medicine. Married with four children he holds several academic and administrative responsibilities in Cincinnati Children’s Hospital Medical Center. Born in 1952 in the Netherlands, Ronald Wanders is a medical biochemist. Professor Wald is Professor of Environmental and Preventive Medicine at the Wolfson Institute of Preventive Medicine at Barts and The London School of Medicine and Dentistry, University of London. He was born in 1944 in the United Kingdom and is married, with 4 children. Rebecca Simmons is Professor of Pediatrics and Obstetrics and Gynecology at the Perelman School of Medicine at the University of Pennsylvania. She is also attending Neonatologist at Children’s Hospital Philadelphia and the Hospital of the University of Pennsylvania. Women and Health Alliance (WAHA) International was created in 2009 by Her Highness Sheikha Shamsa Bint Hamdan bin Mohammed Al Nahayan, wife of His Highness Sheikh Hamdan Bin Zayed Al Nahyan in response to the need for innovative approaches to improve maternal and child health in disadvantaged communities around the world. Dr. Shershah Syed is a graduate of Dow Medical College, Karachi and a Fellow of the Royal College of Obstetricians & Gynaecologists, London. He was trained in Ireland and the United Kingdom and now works in Pakistan. He has a special interest in genital tract fistula and cancer in women. The Faculty of Medicine was established in 1973, and has since developed into an internationally recognized medical school, serving Kuwait and the Gulf region. Its student strength has grown from 48 students in 1976, to the current enrolment level of 105 students in 2012. Since the start of the program, 1,775 students have graduated and have been awarded the Bachelor’s Degree in Medicine & Surgery. The faculty offers a seven-year medical program, and currently has 607 students on roll, in addition to 500 academic, technical and administrative staff. In honor of his Royal Highness Prince Salman bin Abdulaziz Al Saud, the late Saudi Arabian Defense Minister, former governor of Riyadh, the Prince Salman Disability Research (PSCDR) was funded by his Highness Prince Sultan bin Salman bin Abdulaziz Al Saud in 1990 to complement the Disabled Children’s Association (DCA). 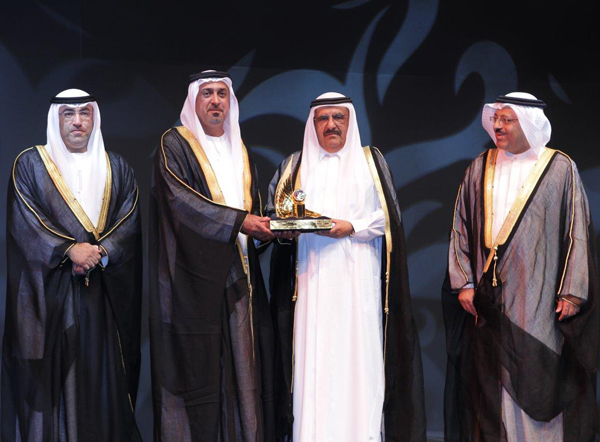 Dr. Abdullah Al Rabeeah was born in Makkah AlMukarramah in 1954. Dr. Abdullah Al Rabeeah was appointed as Minister of Health, Kingdom of Saudi Arabia, in February 2009. 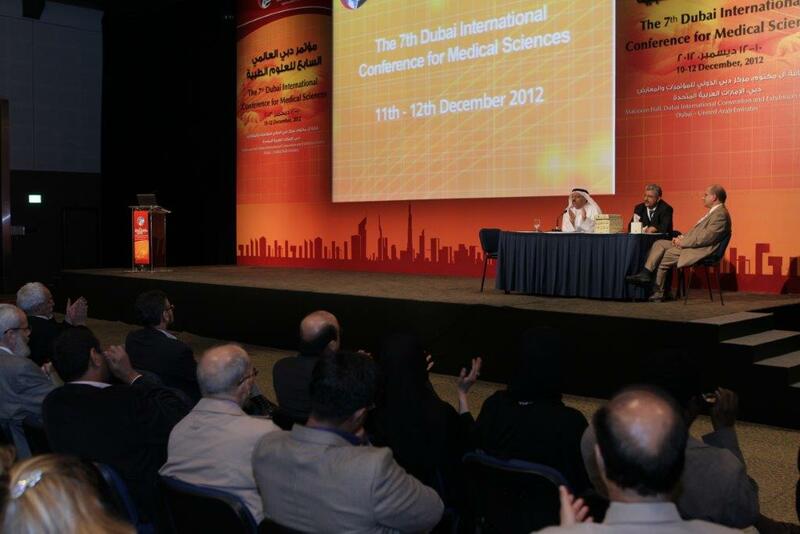 In May 2011, he was Elected as President of the Executive Board of The Arab Health Ministers’ Council. Dr. Anna was born and brought up in Ukraine. She studied medicine at Kiev Medical Institute, University of Ukraine and graduated with an MD in 1972. She is married to H.E. Abdulhafidh Salim Rajab, an Omani national. She’s a mother of 5 children; she speaks English, Arabic, Russian and French fluently. Born in 1952 in Dubai, Prof. Yousef Abdulrazzaq Bastaki completed his medical degree (MD) in 1979 and obtained his Ph.D. in 1985 from London University with his thesis on energy metabolism and growth in preterm neonates. Dr. Husnia Gargash was born in Dubai 1957. She completed her high school education in Dubai, and went on to obtain her Undergraduate medical education from Baghdad Medical College. Dr. Azan BinBrek graduated from Medical School in Glasgow in 1971. He obtained his DCH degree, also from Glasgow, in 1973 while undergoing University rotational training in General Medicine/Cardiology. 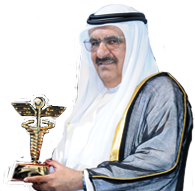 Dr. Mohammed Amin Ahmad Badri, UAE national, born on 17th October 1943 in the emirate of Dubai, is a legendary figure in the UAE, having served thousands of people through his dedicated and exemplary work in the health care domain. 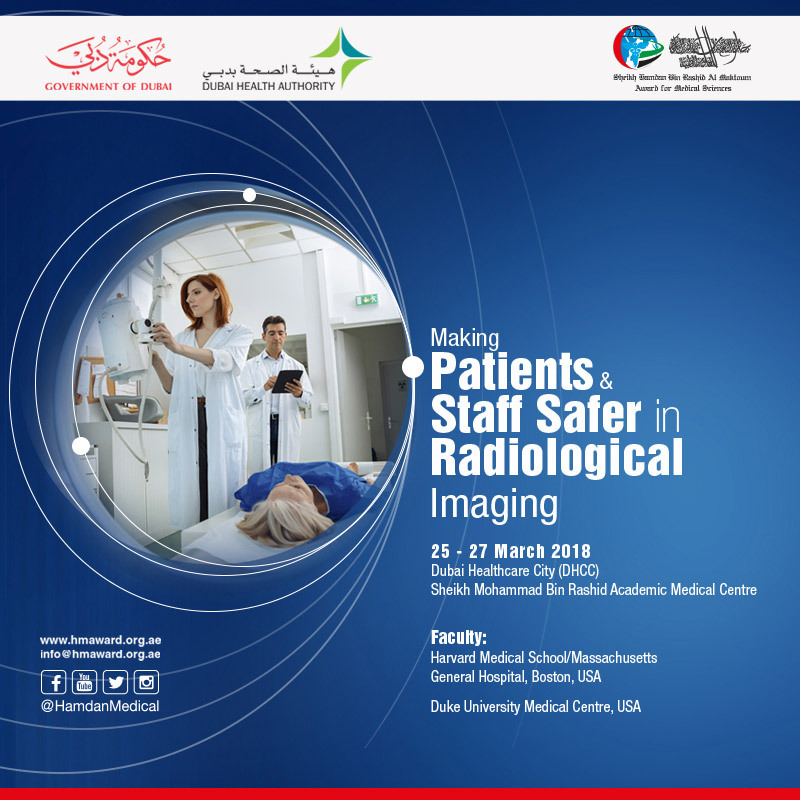 Affiliated with Johns Hopkins Medicine, USA, and operated by Abu Dhabi-based Abu Dhabi Health Services (SEHA), Tawam Hospital has been providing healthcare services to the residents of Al Ain and referral services for the Emirates and the GCC States for the past 30 years. In addition to ambulatory and dental services, the hospital provides a wide spectrum of services including Emergency, Critical Care, Medical, Surgical, Oncology, Maternal and Child Health services. The Cardiac Catheterization facility at Al Qassimi Hospital was established in 2003 as a multidisciplinary model for the prevention, treatment and eradication of heart diseases. The Laboratory is currently one of the busiest interventional catheterization laboratories and a regional resource centre for cardiac emergency care in Sharjah and the Northern Emirates of the United Arab Emirates, and has been established as a tertiary centre for complex coronary and vascular interventions. Mahmoud was born in Eretria in the Eastern Africa in the year 1956. After his schooling, he did his graduation in Veterinary Medicine from Khartoum in Sudan in the year 1979. He submitted his PhD thesis in Pharmacology (to be defended in December 2012) to the Faculty of Pharmaceutical Bioscience, Uppsala University, Sweden.